The updates now appear in the Lync Control Panel where they need to be approved. Select the updates you want to approve, click on Action and select Approve. When Lync Phone Edition clients connect to the network they automatically check if updates are available. If there are updates available, and the client is running idle for x minutes it will automatically update itself. So, there’s no need to take any action. If you want to initiate an update immediately just turn off the phone and turn it on again. It will boot, check for updates and apply the updates. 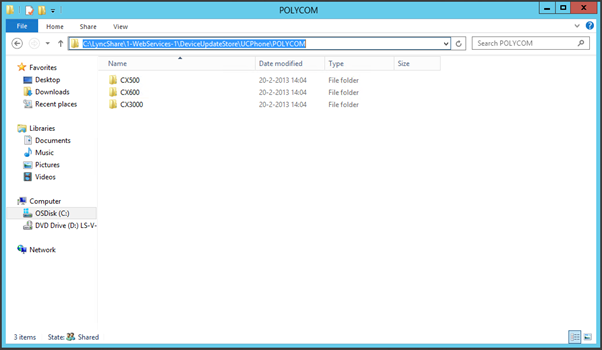 The updates are stored on the file share that’s created during creation of the Lync topology. 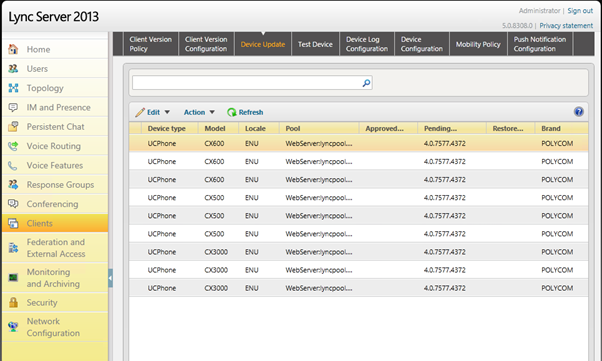 If you logon to this (file)server and navigate to the share, you’ll find the updates in C:\LyncShare\1-WebServices-1\DeviceUpdateStore\UCPhone\POLYCOM (for this example). Updates are logged as well and you can find these log files in the directory C:\LyncShare\1-WebServices-1\DeviceUpdateLogs\Server\Audit\imageUpdates and are called RequestHandlerAuditLog_<<servername>>_<<date>>.log. Clearly visible that the client was updated with the update that was installed in the beginning of this blog.